Images on the dust jacket were taken from the author's extensive collection of rare books and ephemera. All illustrations within the book also come from his collection. It can be difficult to choose which books to talk about on this page when each of them brings such different aspects and dynamics to our work. One of the many that we at Capital A proudly designed and produced in 2010 is on the New Zealand gold rush. The preface and introduction of this book lend important information about New Zealand as well as the author, John Milton Hutchins. Hutchins is the first non–New Zealander to write a historical book on the New Zealand gold rush, which took place about twenty years after California and Australia experienced theirs. Hutchins writes in a traditional viewpoint, making this book very informational but easy to read. The book touches on a broader understanding of New Zealand and “the story of the entire westward and worldwide movement” and informs the reader on “social, political, native-relations, transportation, urban environmental, and mining history” (p. xiv). Whaling lost its popularity as “gold fever” blinded citizens to all other opportunities. Farming, ranching, and merchandising were discarded as professions when the worth of gold rose to sixteen dollars per ounce and was the “immediate equivalent to cash” (p. 3). As more people became involved, the gold rush slowly began to bring change to New Zealand. The belief that every man could strike it rich brought the democratic dream into view. The diversity of the population expanded as men and women from all over the world came to New Zealand to pan for gold: “Those newcomers included not only gold diggers of every color, creed, and nationality, from such locales as Australia, the United States, Canada, and China”(from the dust jacket). Panning was brutal work and led to the search for tools to ease physical demands. Out of necessity, the rocker and the sluice box were soon invented, creating a much more efficient workflow. Gravel, sand, and dirt were shoveled into the rockers and boxes, then washed with ladles of water that carried away all the lighter elements, leaving gold on the bottom. This process proved much less tedious than previous methods, and eventually lead to the introduction of the Long Tom, which was just a larger form of the two previous tools. Soon gold was found in quartz veins, and the advent of hardrock mining required more advances. Machinery and technology were developed to blast through rock, but they required large amounts of money that most miners had yet to acquire. In effect, the mining industry moved from small groups to large corporations to alleviate financial struggle. The extreme violence and crime that resulted in California and Australia from the gold rush acted as a lesson for New Zealand. When gold was found in the islands in the 1850s, New Zealanders were well-prepared. They took preventative measures to keep crime rates at a minimum while still benefitting from the gold. Crime still occurred, but not nearly as wildly as it had in California or Australia. The way the government was split into nine provinces was beneficial to the gold industry. Each area had its own legislative government, and could base their laws and regulations on whatever they chose. This later brought harm to the unity of the nation in the 1860s as each province chose to act “largely on their own when it came to handling crises, whether due to native warfare or to the discovery of gold” (p. 24). D, C, & B was produced in an edition of 1,500 hardcover copies. The book’s dimensions are 6-1/8 x 9-1/4. Included in the 357 pages are an introduction by Duane A. Smith, 19 illustrations, a bibliography, and an index. The book was published in 2010 in Lakewood, Colorado, by Avrooman-Apfelwald Press. 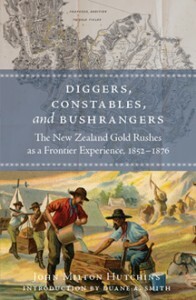 This entry was posted in books and tagged Diggers Constables and Bushrangers: The New Zealand Gold Rushes as a frontier Experience 1852-1876, Duane A. Smith, John Milton Hutchins. Bookmark the permalink.